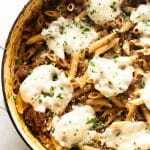 This is a hearty beef and pasta dinner that is ready in about 30 minutes and uses just one pan for easy clean-up! Heat the olive oil over medium heat. Add the ground beef, garlic powder, onion powder, and Italian seasoning. Cook the beef, breaking it up with a spatula, until browned and cooked through. Add the Worcestershire sauce, diced tomatoes, marinara sauce, and parsley and stir to combine. Add the penne and the vegetable stock. Increase the heat to high and bring to a simmer. Lower the heat to medium, cover, and cook for 10-15 minutes or until the penne is tender, stirring frequently. While the pasta is cooking, preheat the oven to broil. Uncover the pan and sprinkle the parmesan over the top. Place the mozzarella slices on top. Transfer the pan to the oven and broil until the cheese is melted. I haven’t tested this recipe with regular penne, but a few readers have and shared in the comments that it works well, too. Check out the comments section in the post to read their comments!